You must always be ready for festivals in India. So whether it’s a Paithani Saari for Ganpati sthapan, Bengal Taant for Durga Pujo or Kasavu sadi for Onam, we have you covered with our traditional Festive Collection. Come Ganesh Chaturthi and Maharashtra is all dressed up in colorful Paithani Silk Saaris. 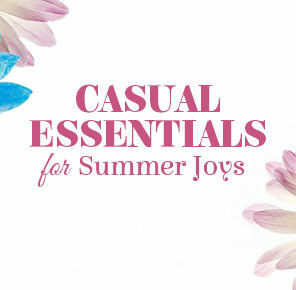 Get them in Jewel Tones like Royal Blue, Emerald Green or Mustard with golden borders. 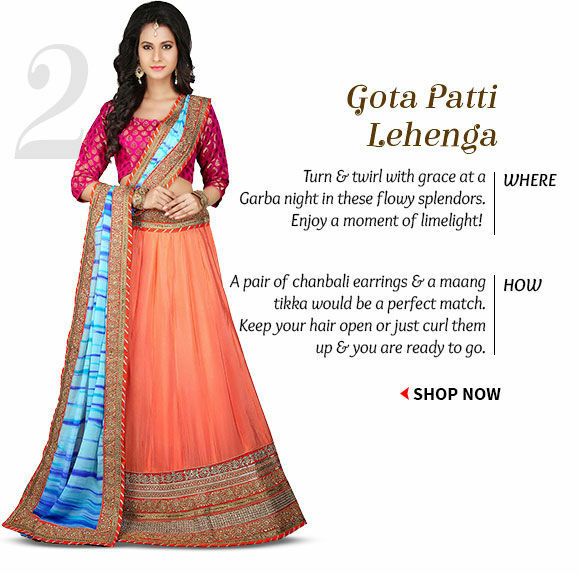 Get set for Gujarat’s Garba season with Gota Patti Lhengas. We have golden streaked Lehanga in Circular and A-line styles with Brocade Cholis in Net, Art Silk, Dupion Silk and Crepe. 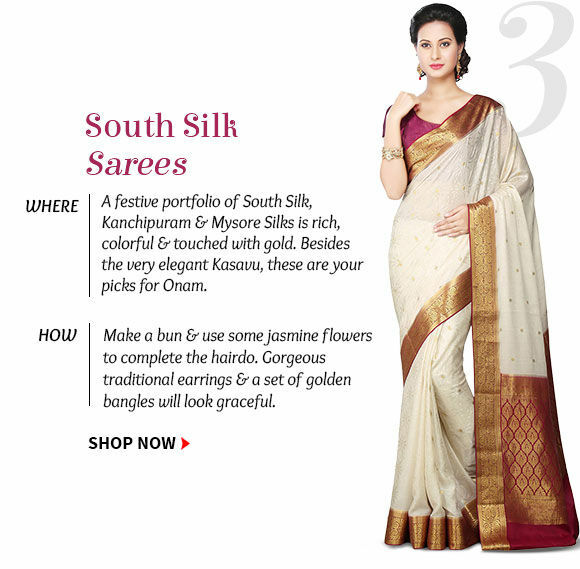 For Onam, Ugadi, Vishu, Puttandu or Sankranti - South India’s famed Silks are here. 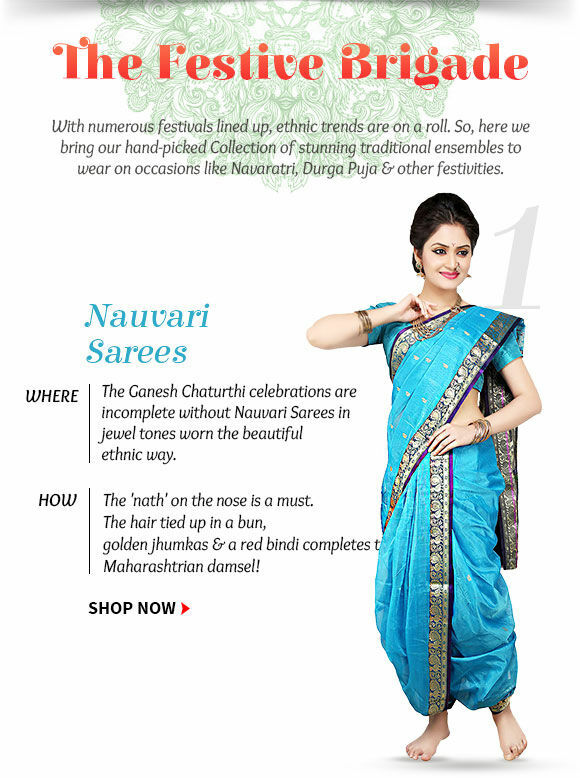 Pick the best of Kanchipuram, Kerala Kasavu, Bangalore & Mysore Silk for the pujas. 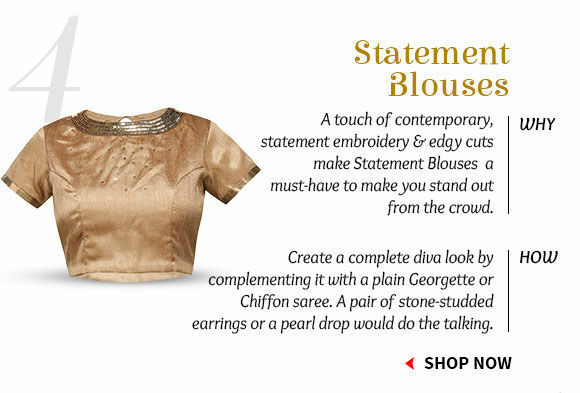 Enhance the festive sharee with designer blouses in Art Silk, Net and Brocade. Explore classic round, V, sweetheart, square and mandarin neck blouses with Zari, Resham, Cutdana work. Durga Puja is the time to flaunt latest Bengal hand weaves like Taant, Garad, Jaamdani Sharee with woven pallus and borders. Take Cotton, Silk and Cotton-Silk variants. 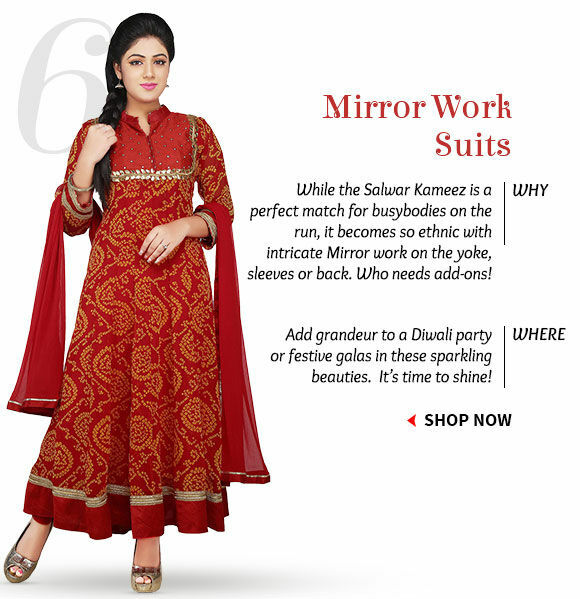 Mirror work Shalwar kamij are Diwali must-haves. We have a huge range of qameez, aanarkali and abaya style suits with Bandhani print, digital print and mirror work. 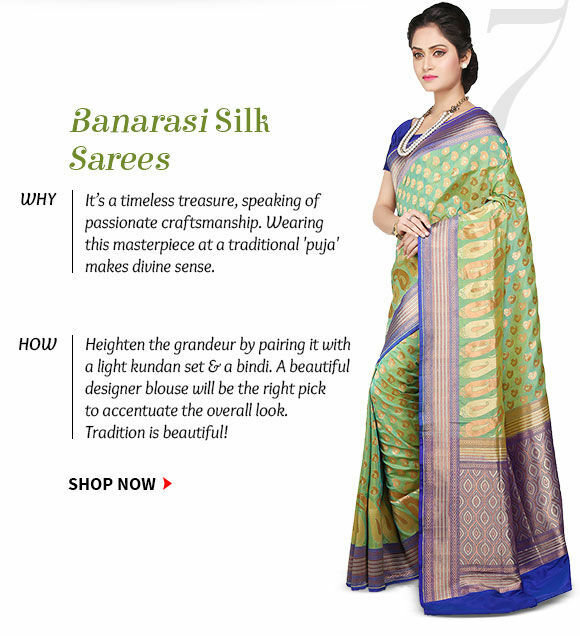 The best attire for pujas and agni phere are Banarasi Silk sharis in Zari work in Red, Yellow, Green and Golden. 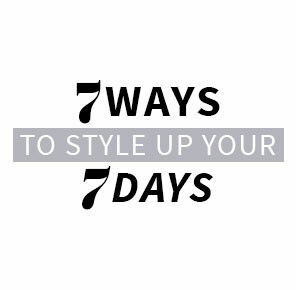 Rani Mukherjee and Vidya Balan rock the look. 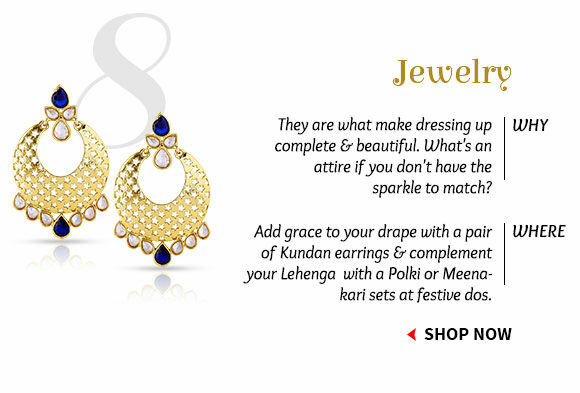 Traditional Jewellelry for festivals includes Kundan necklace, Polki matha patti and rings, Meenakari earrings and bangles in exquisite designs.